Food and drink wise (ever an important consideration to me) it is rather well blessed. It has a nice butcher, a couple of good fishmongers, a deli and a wine merchant. So big tick for self catering. Add to this a fair few pubs, restaurants and cafes, including some really rather good ones, and you have a pretty special place to spend a few days. 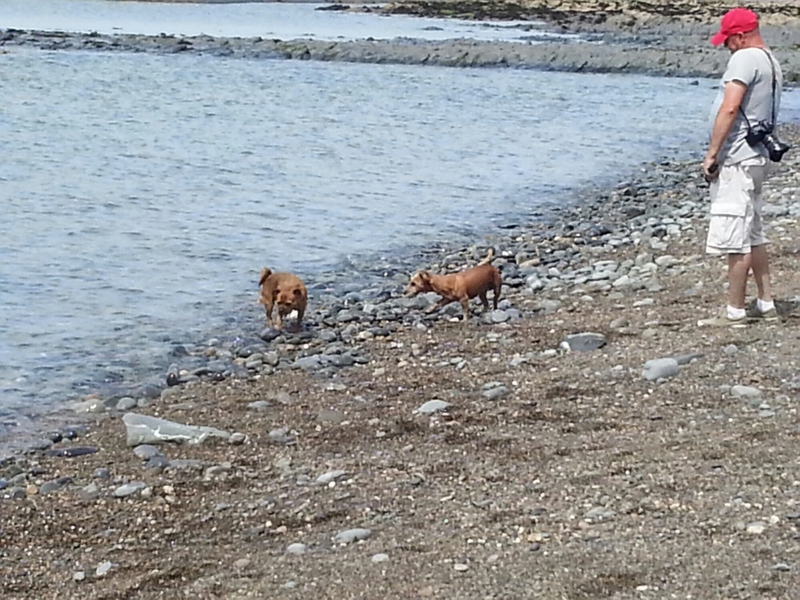 Mrs.SF, myself and the dogs had such a few days this September which was gloriously sunny and afforded us the opportunity to have lunch outside each of the 3 days we were there. 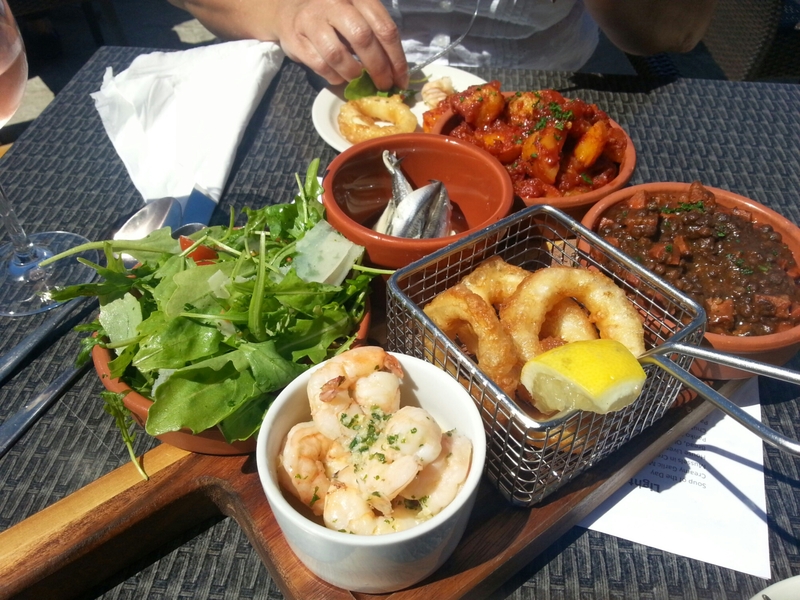 Having tried and loved Manuka on our last visit, we decided to eat out at lunchtime rather than in the evening. 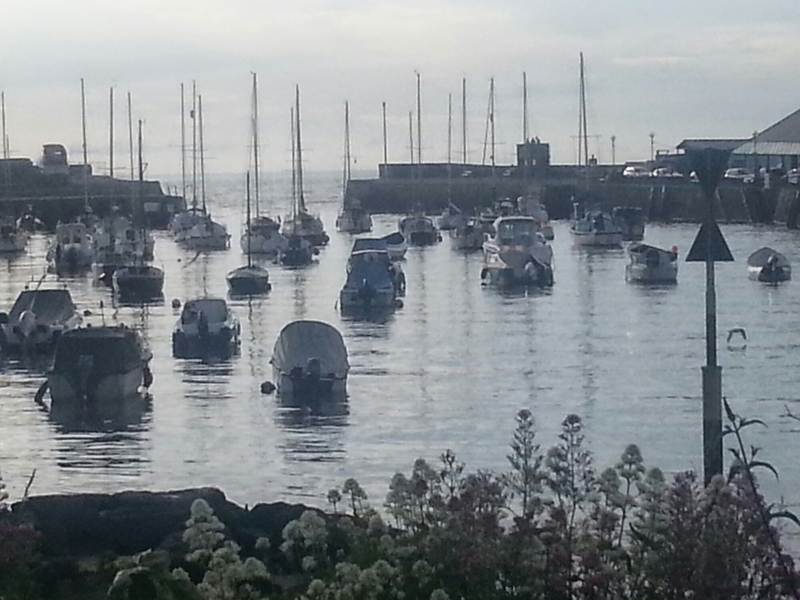 This entailed sampling some of the towns other culinary offerings, clustered around the lovely harbour, in the form of the Cellar, the Harbourmaster and the Hive on the Quay. 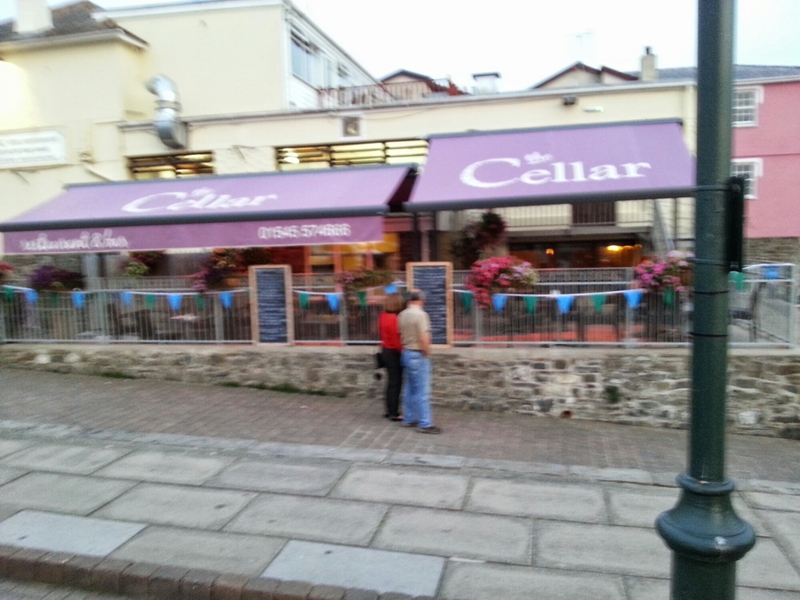 The Cellar sits pretty consistently at the top of the Tripadvisor ratings for Aberaeron and Mrs. SF and I had a good tapas lunch there when we were previously in Aberareon. It is situated in a rather ugly building but has an outside terrace which has great views of the inner harbour and looks nice enough inside. In the day there is a lunch time menu (on which open sandwiches feature heavily), as well as a tapas menu. I went for an open steak sandwich (£7.75) whereas Mrs.SF went for the slightly odd sounding (to me at any rate) oven roasted salmon ploughmans (£9.75). We also ordered a side of chips (for me). It was a lovely day and with a bottle of Punk IPA (me – £3.00) and a glass of rose (Mrs. SF – 250 ml- £6.20) it was very pleasant just sitting on their terrace soaking up the sun. 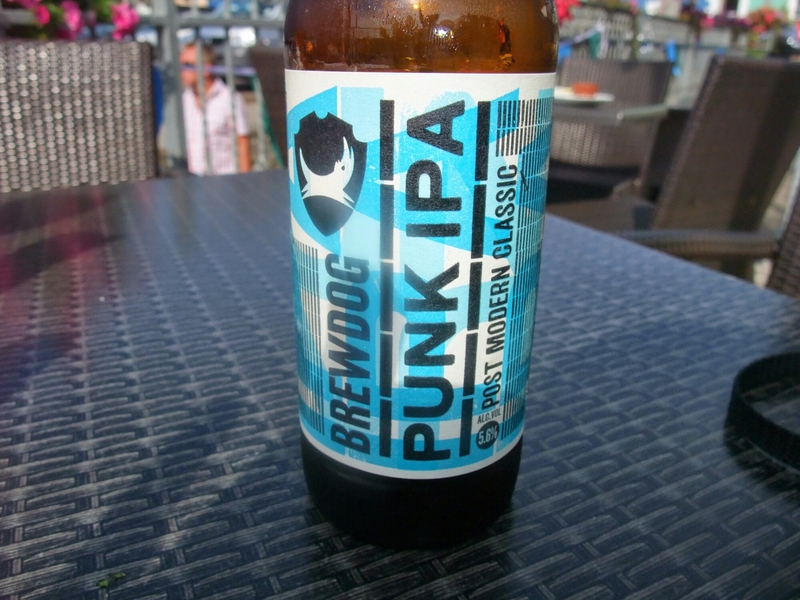 The wait for the food was a bit long (not a problem as we were enjoying the sun being out) so when it arrived I needed another Punk IPA – oh the horror. 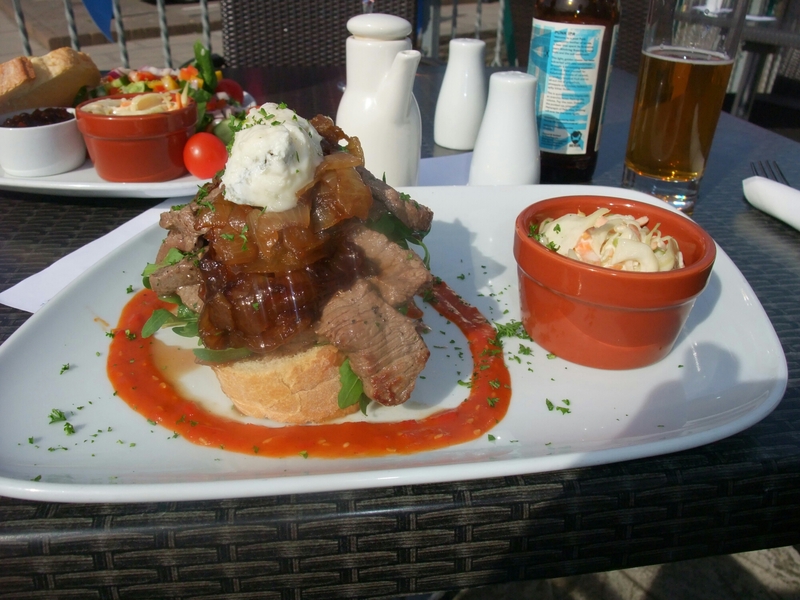 My open steak sandwich was a good sized beast and consisted of a slice of proper white bread topped with rocket, nicely caramelised onions and thick strips of good quality tender steak (rump) cooked medium rare as requested. Add to this a nice salty, sharp blob of dolcelatte cheese on the top and you had a happy me. 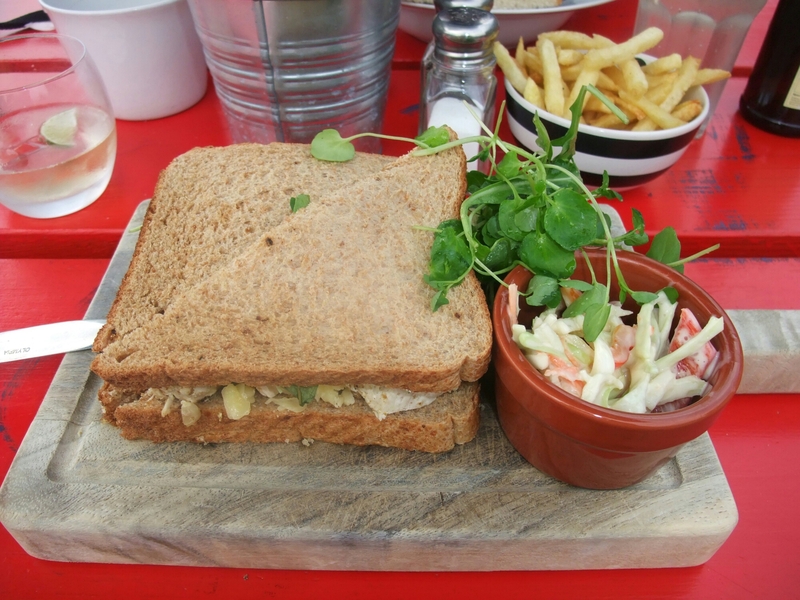 It also came with a nice enough, if slightly pedestrian, coleslaw. Whilst not fancy it was a nice dish the really hit the spot. Mrs. SF’s dish of a oven roasted ploughmans was as odd as it sounded. A decent piece of nicely cooked salmon (farmed no doubt. – well it was part of ploughmans :)) was paired with a side salad (lacking anything more than a dribble of dressing), a doorstop slice of bread, new potatoes, coleslaw and most bizzarely a pot of branston pickle. Branston with hard cheese – yes, ham – yes, salmon – definitely no. Somethings go together and salmon and branston pickle ain’t one of them. Whilst the separate components of this dish were fine, together they didn’t gel at all. 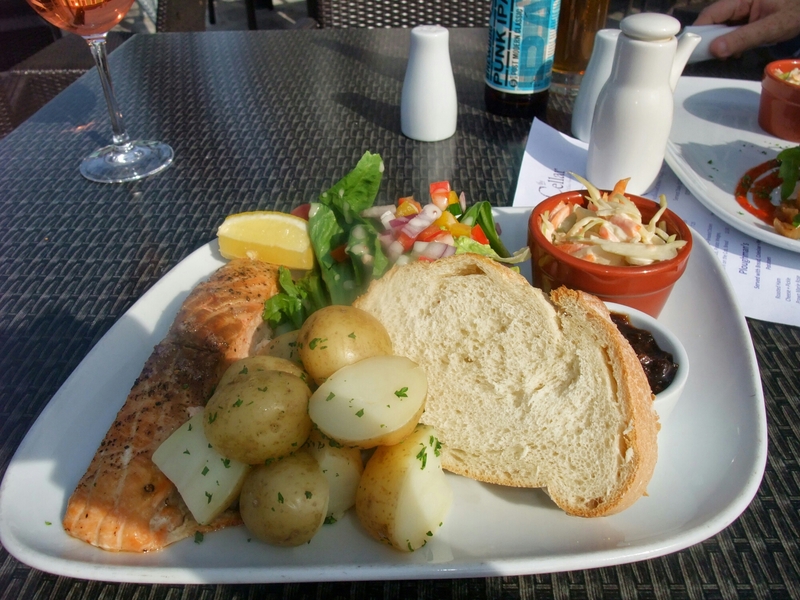 Cut out the bread, coleslaw and pickle and make it salmon with new potatoes and a side salad (properly dressed) and it would have been very nice. As it was it was just a bit odd. The chips were nice (salty and crispy on the outside and nicely fluffy on the inside) and they kindly took (without us asking) the chips and one bottle of Punk IPA off the bill due to the delay in the food arriving. Good customer service like that should be applauded. For doggie people, dogs are allowed on the terrace but not inside. 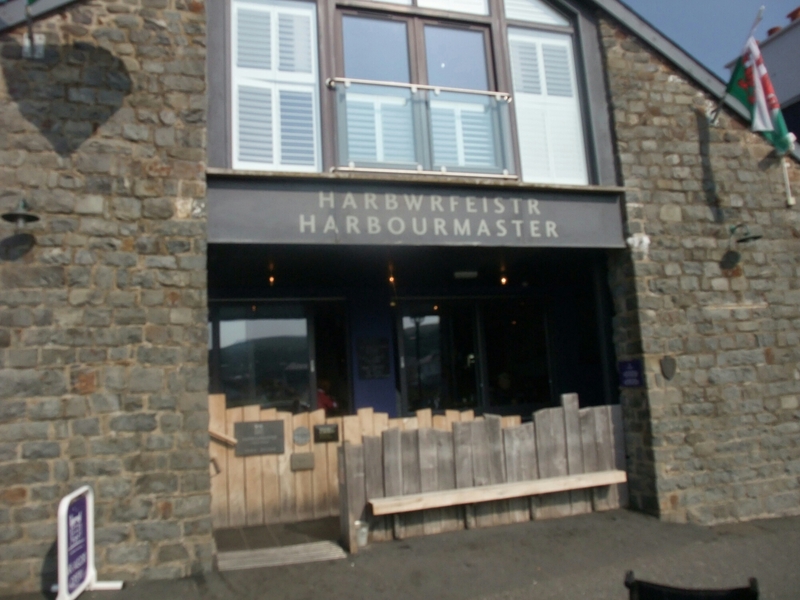 The grand dame of eating establishment in Aberearon, the Harbourmaster is always a safe bet for a good meal. 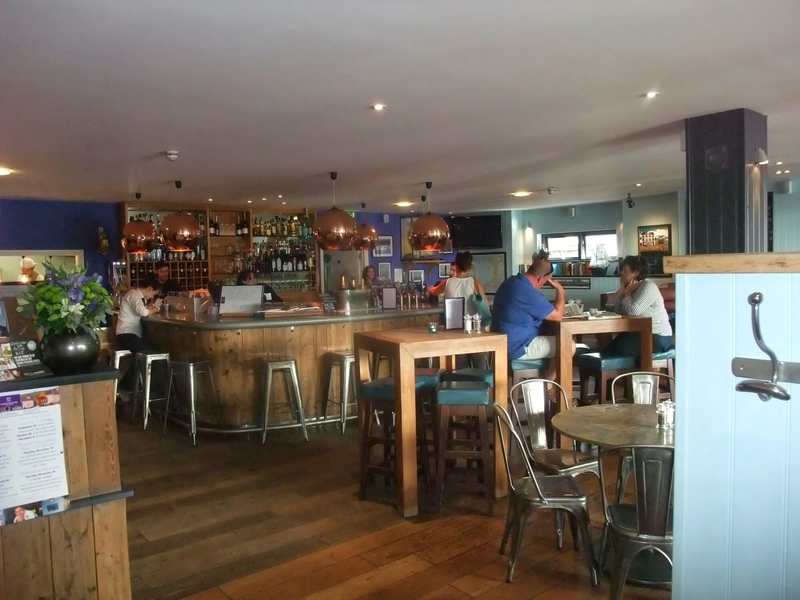 It has a lovely bar area with a very decent selection of wines by the glass. 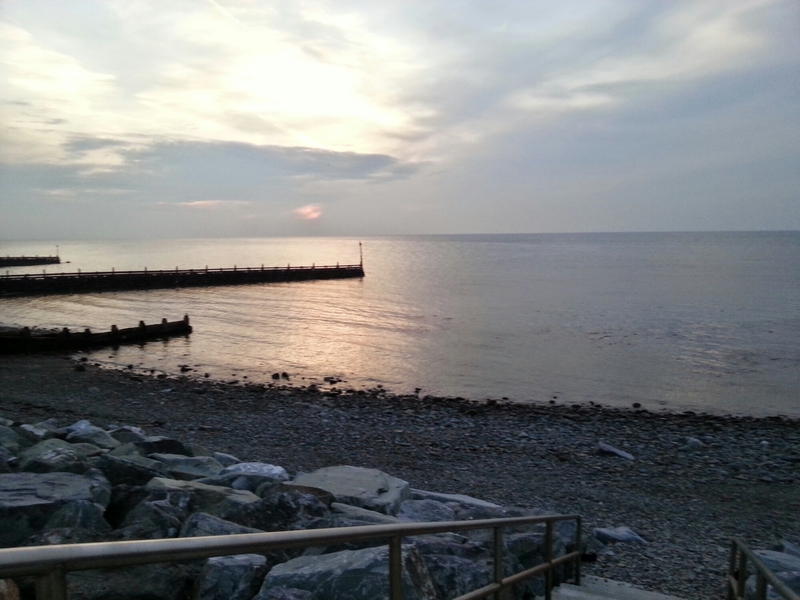 It is our favourite place for a sundowner in Aberearon. They have a large and varied bar menu which is full of nice sounding stuff ( http://www.harbour-master.com/hotel-wales/food-drink/), but on the day in question both Mrs SF and I were drawn to one of the specials on the blackboard by the bar. 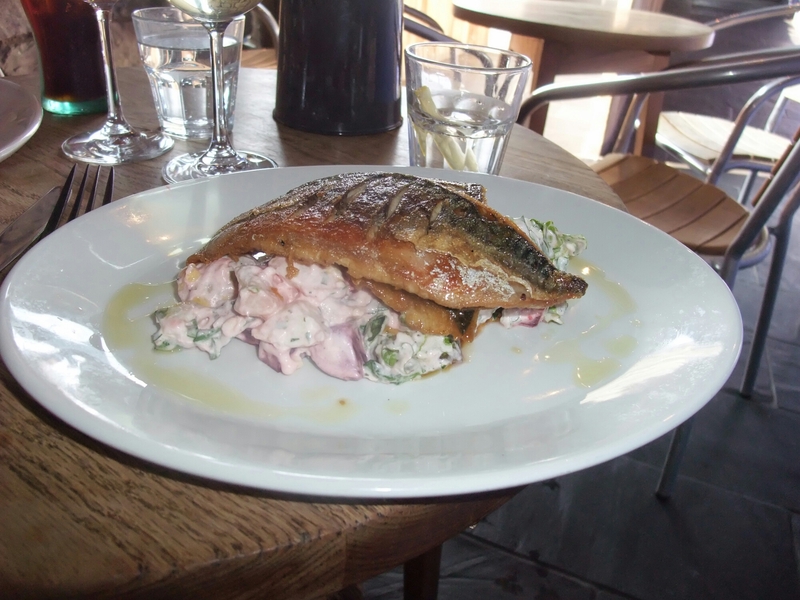 This was a lovely grilled piece of mackerel (£11), atop a beetroot and potato salad spiked with a good amount of horseradish (that nature accompaniment to oily mackerel). The fish was perfectly cooked with a nice crisp skin and moist flesh. My only complaint was I had couple of rather large bones in mine – no biggie for me, but the sort of thing that puts some people off. The beetroot, horseradish and potato salad added a nice bite to the dish and with a nicely chilled glass of muscadet (250ml – £6.60) made for a very pleasant lunch. Possibly a touch pricey at £11 bearing in mind mackerel is as cheap as chips. Doggie wise there are two tables outside and a table undercover (but not in the bar area) where you can eat with dogs (no dogs inside though am afraid). 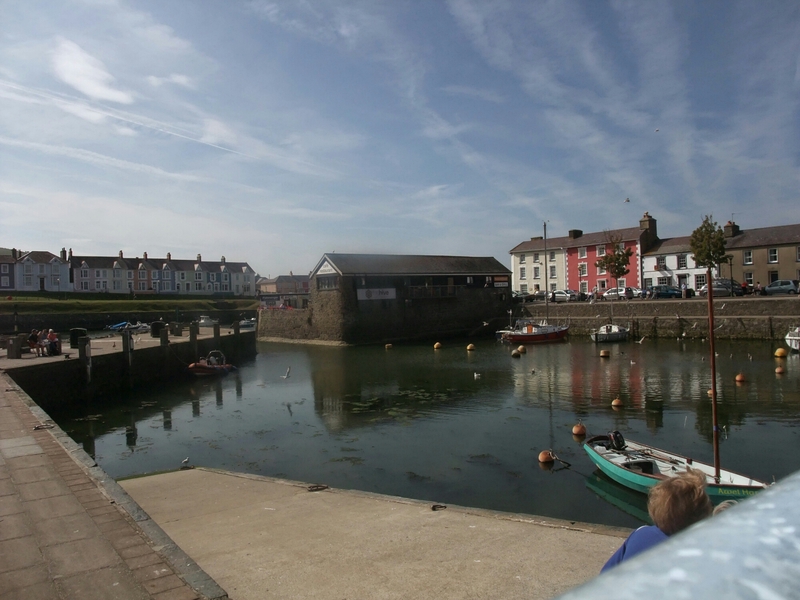 The The Hive on the Quay sits on the corner of the main and inner harbours. 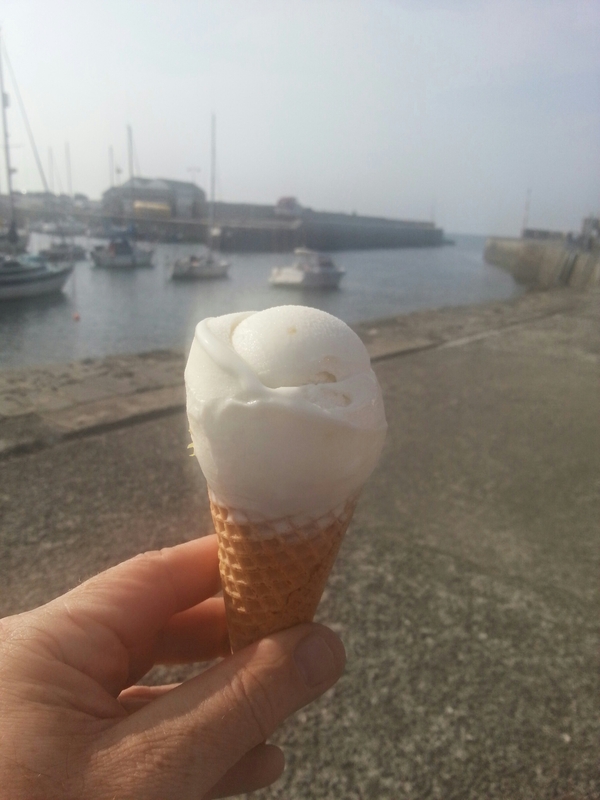 Its main claim to fame is honey ice cream (sold out the front)), but it is also a nice spot for lunch especially on a sunny day as it has a large outside eating area ( which is doggie friendly). 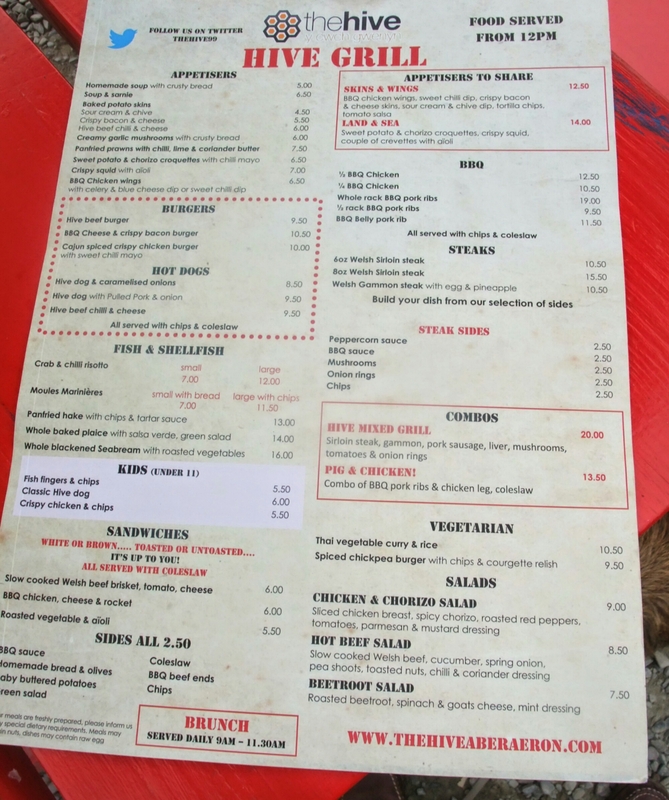 They have a quite wide menu on offer at lunch time which covers burgers, hot dogs, sandwiches and BBQ staples, as well as fish. 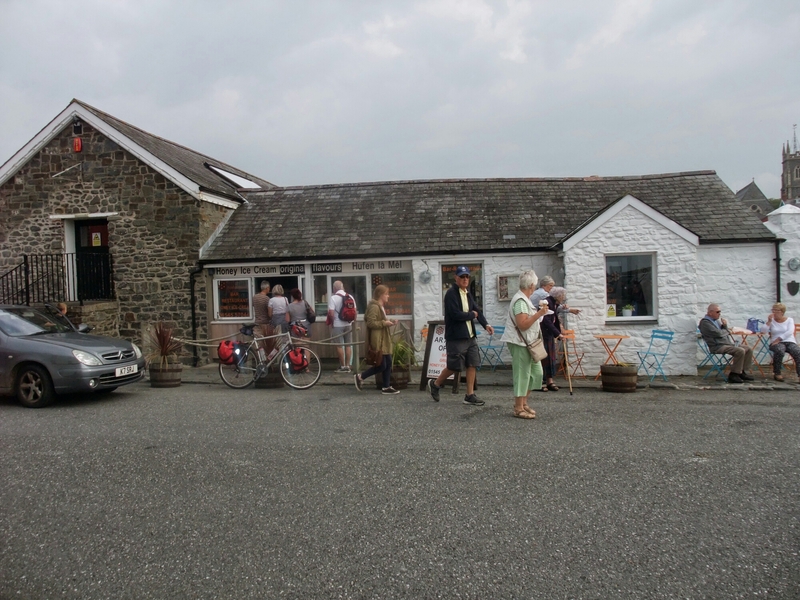 I went for the small bowl of moules – £7.00 (which came with bread rather than fries) and Mrs. SF, a barbequed Chicken and cheese sandwich (£6.00). The later was offered toasted, but Mrs. S.F went for it untoasted (personally I thought melted cheese would have worked better). She pronounced it nice with a decent amount of tasty filling, a good accompanying pot of coleslaw and nice crispy, salty French fries. My moules were lovely plump bivalves (it helps in sourcing your seafood when you have your own fishmonger next door – Fish at the Hive) which came with a lovely winey liquor. I love a good bowl of moules mariniere and these were a fine example. I was driving back home that day so no booze, but they has a decent selection of beers, wine and soft drinks on offer. 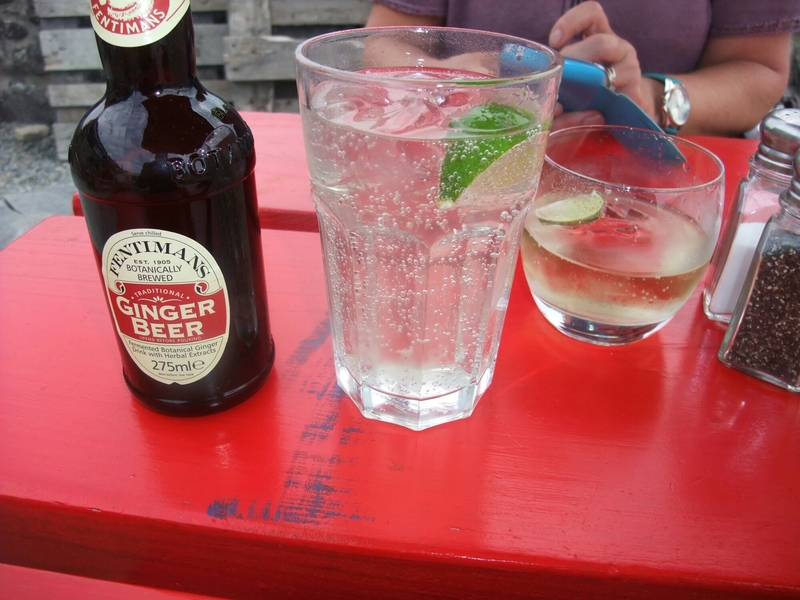 I went for a Fentimens ginger beer. Afterwards we went out front for dessert in the form of a cone of lovely honey ice cream. 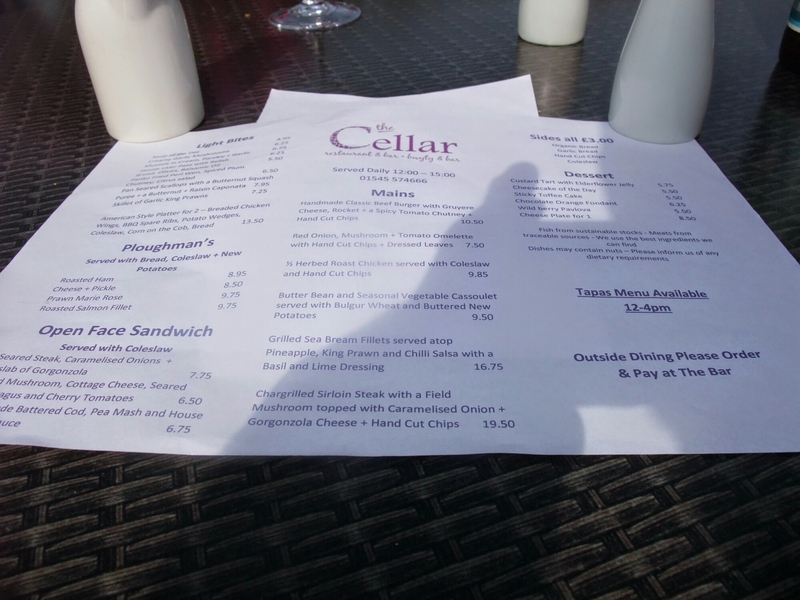 All three places are lovely for a nice relaxing lunch (all the better if the sun is out in beautiful Aberearon) and we enjoyed the food at all of them (bar from the somewhat weird salmon ploughmans at the Cellar). Would I go back? 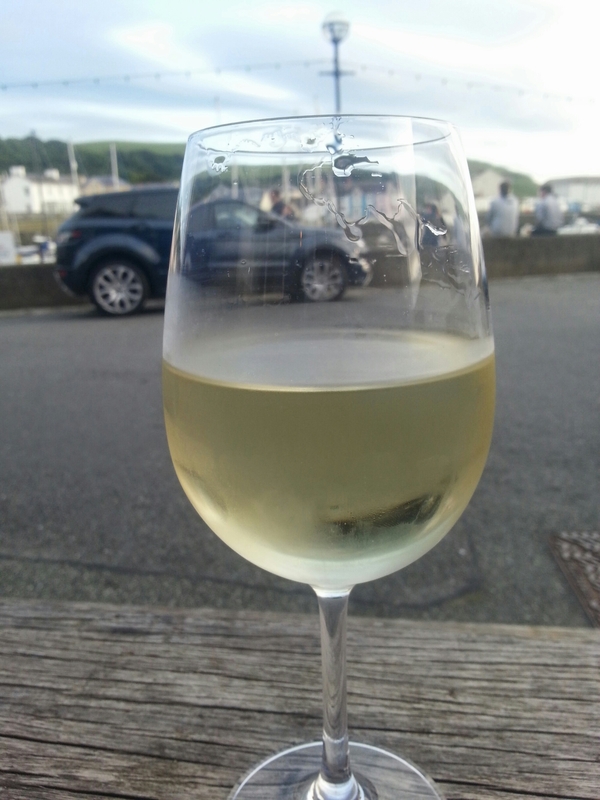 Oh yes, we can’t wait to go back to Aberaeron and would happily eat at all three of these places again (Mrs. SF would choose more wisely at the Cellar, mind) when we do. 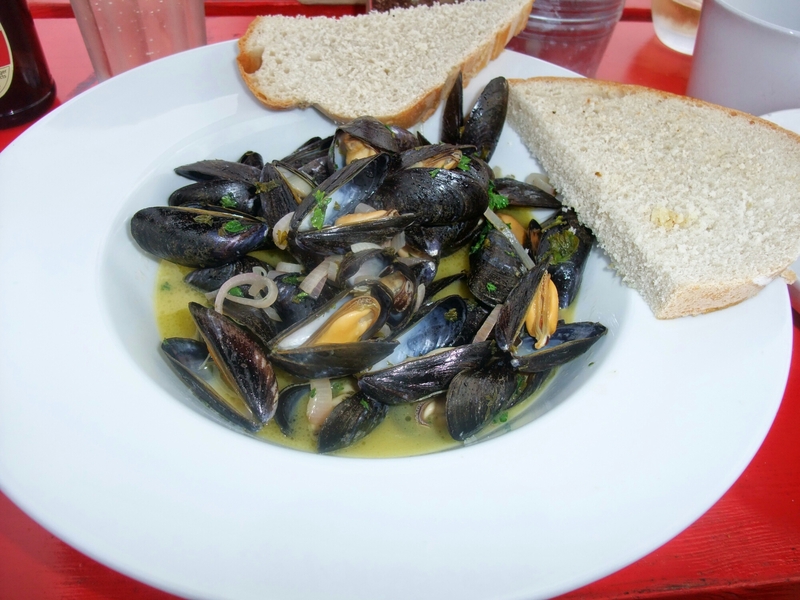 Dish of the week – my moules. 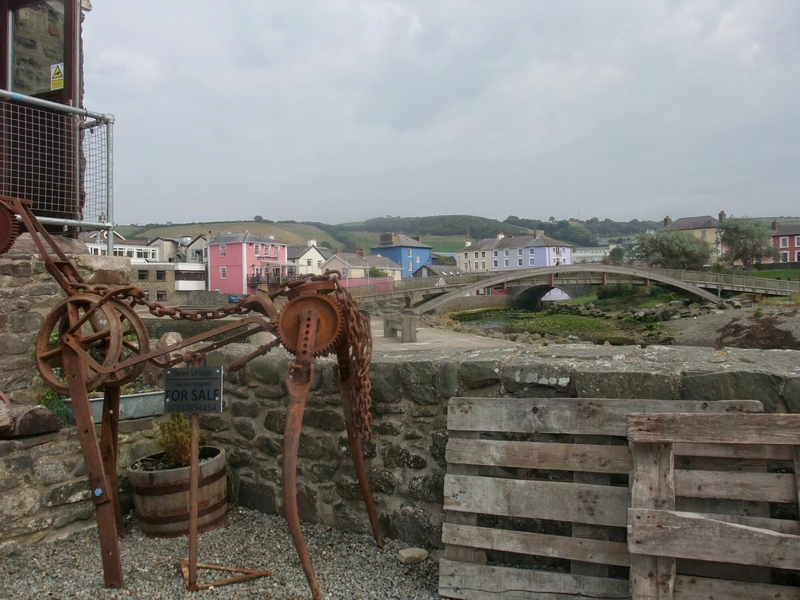 This entry was posted on Oct 12, 2014 by solicitingflavours in dog friendly, Food, Food and wine products, lunch, Restaurant Review, Wales, wine.